The balcony of Aghia Paraskevi's Monastery with view at Vikos gorge. 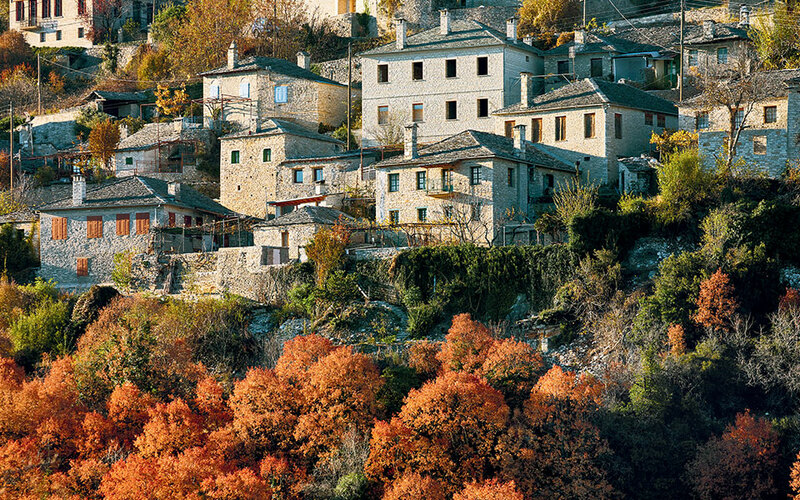 The winding mountain roads of the Zagori region can be challenging, but they take you to wonderful villages in one of Greece's most gorgeous landscapes. Whatever the speed at which you may have travelled up the Ionia Odos (Motorway 5), which now links Athens to Ioannina and has shortened the travel time to just four and a half hours, as soon as you arrive in the region Zagori your speed and driving experience will change radically. In my own experience, one of the most memorable sights I’ve seen was that of an eagle suddenly appearing at eye level as he swooped down low the first time I ever entered the village of Monodendri. This is a landscape of bends and steep mountain slopes. Stop at the Monastery of Aghia Paraskevi, a short distance away from Monodendri, in order to enjoy the pure, clean air and incredible view. 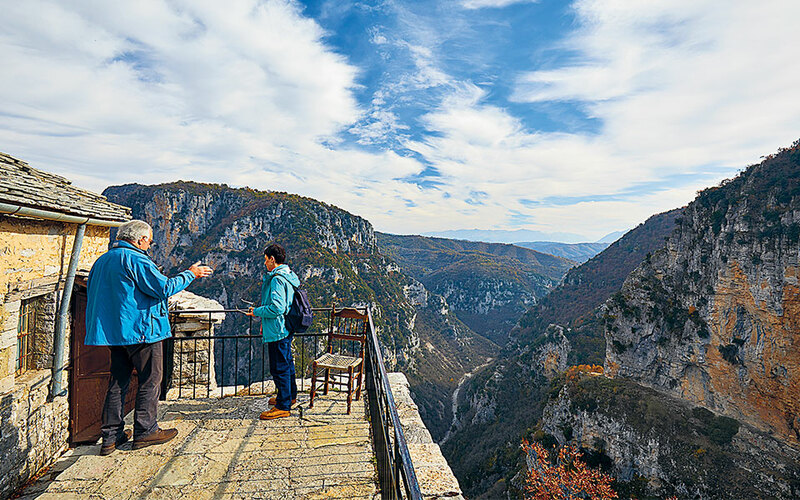 This is the point where the Vikos Gorge opens up wide before you and you suddenly realize that you are about to come face to face with one of this country’s most imposing landscapes. For the more daring, the short walk right on the edge of the rock face constitutes the perfect welcome to this cluster of mountains of the Pindos massif, whose name in antiquity was Panoraia [‘the supremely beautiful one’]. 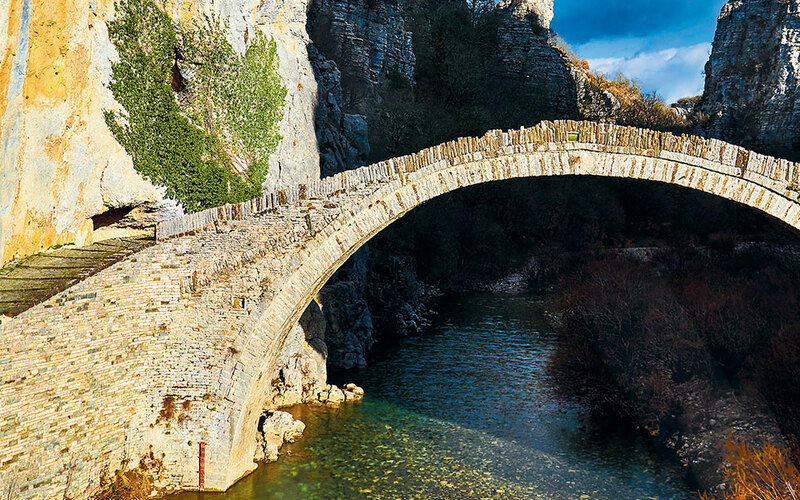 Because of the natural relief of the terrain, Zagori does not have a central road cutting through it; instead it boasts numerous outstanding short routes, which link one village to another. The next stop is the observation point Oxia, for yet another view of the gorge from high above. A donkey that in recent years has developed the habit of wandering around the area can be seen at times crossing paths with Northern European tourists, or striking a pose so that children may have their picture taken by its side. 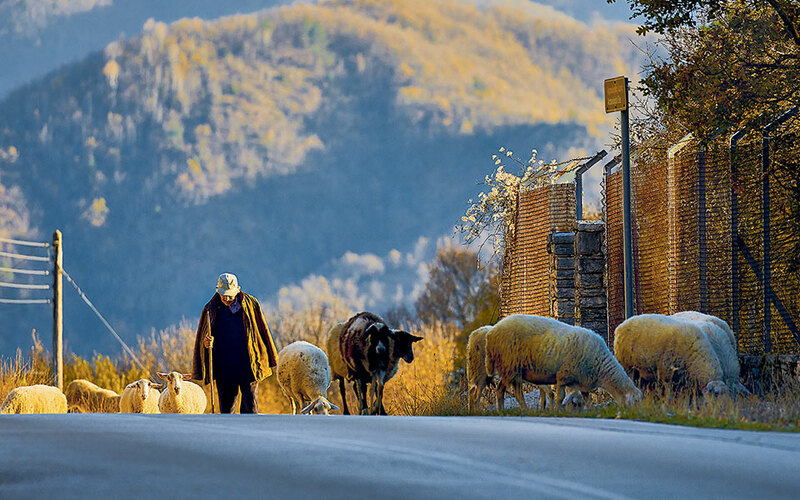 As you continue on towards the west, every crossroads is also a temptation for a closer encounter with the Zagorohoria, the 60-plus villages that make up this unique community. The village of Dilofo has barely a handful of residents, and its architectural character remains unspoiled, even if it bears clear signs of neglect and abandonment. The village of Vitsa is more developed touristically, and offers some good dining options, such as the restaurant Kanela kai Garyfallo [‘Cinnamon and Clove’] (tel. 26530-71671), with a menu that focuses on mushrooms, both wild and cultivated. Every village exudes authenticity and an incomparable aesthetic – such as the village of Kapesovo, and even more so the village of Tsepelovo, with its huge plane tree in the main square and its noteworthy tavernas. Every route within the region of Zagori is full of unpredictability. You may find your way blocked by a herd of cows or a horse, or then again you may find yourselves transfixed by one of the elegant traditional stone bridges, such as the bridge of Kokkori, between the villages of Dilofo, Koukouli and Kipoi, which emerges suddenly to the left of the main road. As you head towards Papigo, when you catch sight of the tower-like peaks of Astraka, you will know that you are on the boundary between Central and West Zagori. Drive towards the bridge of Aristi (otherwise known as Papigo bridge, according to the inhabitants of the latter) and you will find yourselves on the banks of the Voidomatis River, whose water flows all the more torrentially during winter (and which lends itself to white water rafting). For your stay, choose either one of the many guest houses with their rustic mountain aesthetic, such as Astra Inn (Megalo Papigo, tel. 26530-42108, astra-inn.gr, prices start at €70 for a double), or one of the several very interesting hotels. Dine at the restaurant Salvia, part of the Aristi Mountain Resort (tel. 26530-41330, aristi.gr). Finally, and provided of course that the weather allows, head for the village of Kolymbithres and walk among the area’s unique plunge pools and rock formations. This is one of the most tranquil spots of a region that, in any case, will enchant you with the ruggedness of its landscapes and the serenity that they exude. The routes between Monodendri and Tsepelovo, and between Vitsa and Greater Papigo each have a total length of 28km.